The inswinger moves in the air from the off side of a right handed batsman to the leg side. The later the bowl swings into the batsman, the more effective it will be. The amount of inswing a bowler can generate depends on plenty of different factors like the weather, the bowler's action and the condition of the ball. But the most important factor to consider is the grip on the seam of the ball and its direction. Another point to remember is to work on shining the ball on one side during and before each delivery. This will help the ball to swing more in the air. 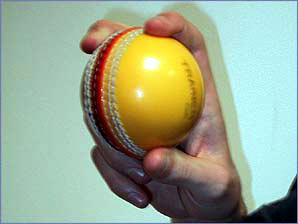 Grip the ball with the first two fingers close together on the seam, with the seam in a vertical position. The thumb should be on the seam underneath. Angle the seam towards leg slip or, but keeping it vertical. The shiny side of the ball should be furthest from the batsman.